An Engineering Approach: Why did Titanic sink? As soon as the waves of the North Atlantic closed over the stern of RMS Titanic on 15 April 1912, the myths began surrounding her design, construction and transatlantic voyage. The Titanic disaster today is a classic tale, a modern folk story, but like all folk stories, our understanding of what really happened has been clouded by the way the disaster has been recounted over the years.It was said that the builders and owners of Titanic claimed she was ‘unsinkable’. The claim actually made was that she was ‘practically unsinkable’, close enough, but nevertheless an unfortunate statement and one which would haunt both builder and owner for years. This article tries to explain material and design failures that caused the rapid sinking of Titanic. Titanic collided with a massive iceberg and sank in less than three hours. Damaging nearly 300 feet of the ship’s hull, the collision allowed water to flood six of her sixteen major watertight compartments. At the time, more than 2200 passengers and crew were aboard the Titanic for her maiden voyage to the United States. Only 705 survived. According to the builders of the Titanic, even in the worst possible accident at sea, the ship should have stayed afloat for two to three days. On the night of April 14, although the wireless operators had received several ice warnings from others ships in the area, the Titanic continued to rush through the darkness at nearly full steam. A time line of the events that followed is shown in Table 1. Lookouts spot the iceberg 1/4 mile ahead. The Titanic sideswipes the iceberg, damaging nearly 300 feet of the hull. Watertight compartments are filling; water begins to spill over the tops of the transverse bulkheads. The bow pitches; water floods through anchor-chain holes. The bow continues to submerge; propellers lift out of the water. The Titanic tilts 45 degrees or more; the upper structure steel disintegrates. The stern raises up out of the water; the bow, filling with water, grows heavier. Weighing 16,000 tons, the bow rips loose; the stern rises to almost vertical. The stern slips beneath the surface. Coasting at about 13 mph, the bow strikes the ocean floor. Falling at about 4 mph, the stern strikes the ocean floor. Table 1. – Timeline of the sinking of the Titanic. The two pieces of the Titanic lie 2,000 feet apart, pointing in opposite directions beneath 12,500 feet of water. The bow section remains mostly intact, although the damaged portion of the hull is covered with a 35-foot high wall of silt and mud that plowed up when the Titanic hit bottom, so the point of fracture can not be seen. For 73 years, the Titanic remained undisturbed on the ocean floor. On September 1, 1985, oceanographer Bob Ballard and his crew discovered the wreck of the Titanic about 350 miles southeast of Newfoundland, Canada . Since then, four more expeditions have visited the Titanic. In 1991, the first purely scientific team visited the site. The dive was called the Imax dive because the purpose was to create a film for Imax theaters. The Soviet submersibles used in the dive were capable of staying submerged for twenty hours and were equipped with 110,000-lumen lamps. With this equipment, scientists were able to take pictures of the Titanic wreck and eventually uncover new evidence into the cause of the Titanic disaster. On an expedition in 1991 to the Titanic wreck, scientists discovered a chunk of metal lying on the ocean floor that once was a part of the Titanic’s hull. The Frisbee sized piece of steel was an inch thick with three rivet holes, each 1.25 inches in diameter . Since the retrieval of this piece of steel, extensive research has been done to uncover additional clues to the cause of the rapid sinking of the Titanic. The following is a discussion of the material failures and design flaws that contributed to the disaster. When the Titanic collided with the iceberg, the hull steel and the wrought iron rivets failed because of brittle fracture. A type of catastrophic failure in structural materials, brittle fracture occurs without prior plastic deformation and at extremely high speeds. The causes of brittle fracture include low temperature, high impact loading, and high sulphur content. On the night of the Titanic disaster, each of these three factors was present: The water temperature was below freezing, the Titanic was travelling at a high speed on impact with the iceberg, and the hull steel contained high levels of sulphur. 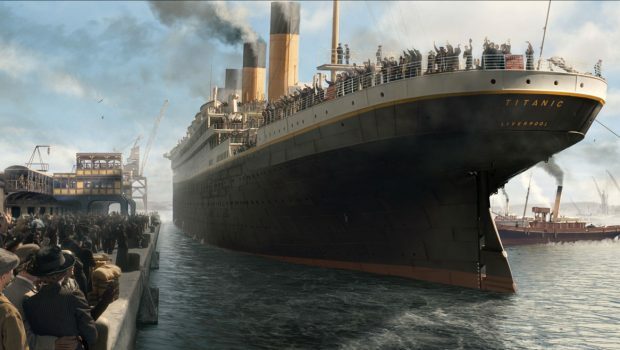 The first hint that brittle fracture of the hull steel contributed to the Titanic disaster came following the recovery of a piece of the hull steel from the Titanic wreck. After cleaning the piece of steel, the scientists noted the condition of the edges. Jagged and sharp, the edges of the piece of steel appeared almost shattered, like broken china. Also, the metal showed no evidence bending or deformation. Typical high-quality ship steel is more ductile and deforms rather than breaks. The material used in titanic showed brittle properties under the cold weather temperatures and caused that catastrophic failure. The wrought iron rivets that fastened the hull plates to the Titanic’s main structure also failed because of brittle fracture from the high impact loading of the collision with the iceberg and the low temperature water on the night of the disaster. Figure shows the Titanic during her construction, with the riveted hull plates of her stern visible. With the ship travelling at nearly 25 mph, the contact with the iceberg was probably a series of impacts that caused the rivets to fail either in shear or by elongation. As the iceberg scraped along sections of the Titanic’s hull, the rivets were sheared off, which opened up riveted seams. Along with the material failures, poor design of the watertight compartments in the Titanic’s lower section was a factor in the disaster. The lower section of the Titanic was divided into sixteen major watertight compartments that could easily be sealed off if part of the hull was punctured and leaking water. After the collision with the iceberg, the hull portion of six of these sixteen compartments was damaged, as shown in the figure above. Sealing off the compartments was completed immediately after the damage was realized, but as the bow of the ship began to pitch forward from the weight of the water in that area of the ship, the water in some of the compartments began to spill over into adjacent compartments. Although the compartments were called watertight, they were actually only watertight horizontally; their tops were open and the walls extended only a few feet above the waterline. 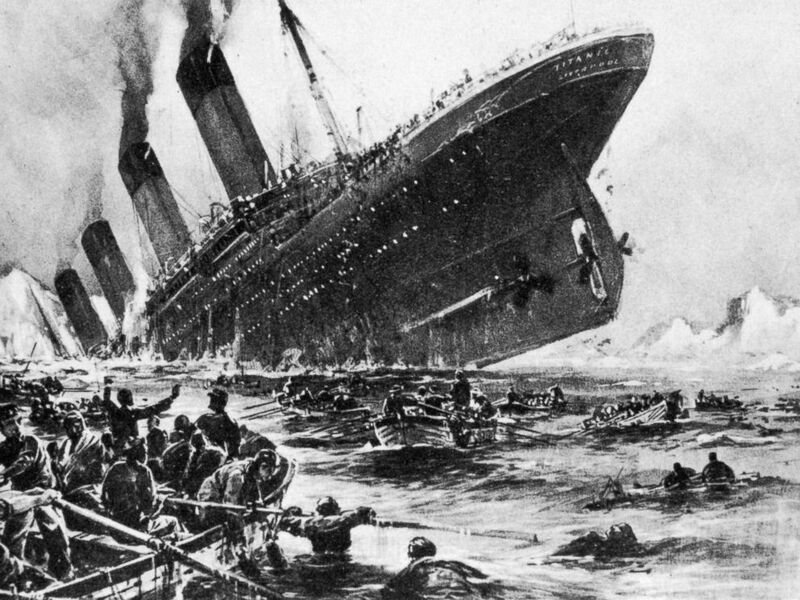 The sinking of the Titanic has become one of the most well known disasters in history. Because of the terrible loss of life and the demise of what everyone believed was an “unsinkable” ship, people are intrigued and curious about what caused the rapid sinking of the Titanic.The failure of the hull steel resulted from brittle fractures caused by the high sulphur content of the steel, the low temperature water on the night of the disaster, and the high impact loading of the collision with the iceberg. When the Titanic hit the iceberg, the hull plates split open and continued cracking as the water flooded the ship. Low water temperatures and high impact loading also caused the brittle failure of the rivets used to fasten the hull plates to the ship’s main structure. On impact, the rivets were either sheared off or the heads popped off because of excessive loading, which opened up riveted seams. Also, the rivets around the perimeter of the plates elongated due to the stresses applied by the water, which broke the caulking and provided another inlet for the water. The rapid sinking of the Titanic was worsened by the poor design of the transverse bulkheads of the watertight compartments. As water flooded the damaged compartments of the hull, the ship began to pitch forward, and water in the damaged compartments was able to spill over into adjacent compartments. Not only did the compartments not control the flooding, but they also contained the water in the bow, which increased the rate of sinking. Division of the History of Technology, Transportation Collections, National Museum of American History, in cooperation with the Public Inquiry Mail Service, Smithsonian Institution, “The Titanic,” http://www.si.edu/resource/faq/nmah/titanic.htm (Washington, DC: Smithsonian Institution, May 1997). Gannon, Robert, “What Really Sank the Titanic,” Popular Science, vol. 246, no. 2 (February 1995), pp. 49-55. Garzke, William H., David K. Brown, and Arthur Saniford, “The Structural Failure of the Titanic,” Oceans Conference Record (IEEE), vol. 3 (1994), pp. 138-148. Hill, Steve, “The Mystery of the Titanic: A Case of Brittle Fracture?” Materials World, vol. 4, no. 6 (June 1996), pp. 334-335. Manning, George, The Theory and Technique of Ship Design (New York: John Wiley and Sons, Inc., 1956), pp. 25-53. Muckle, William, Modern Naval Architecture (London: W.P. Griffith & Sons, 1951), pp. 121-125. Refrigerator, Mister, “R.M.S. Titanic,” http://www.scv.net/~fridge/index.htm (May 1998). Rogers, Patrick, Anne-Marie O’Neill, and Sophfronia S. Gregory, “Sunken Dreams,” People, vol. 49, no. 10 (March 1998), pp. 44-51. Society of Naval Architects and Marine Engineers, Principles of Naval Architecture, 4th ed. (New York: The Society of Naval Architects and Marine Engineers, 1977), pp. 121-133.